Governor McDonnell announced yesterday that four new communities can now tout their distinction as Designated Virginia Main Street Communities. The new communities are the cities of Hopewell and Bristol and the towns of Farmville and St. Paul. They were chosen based on a combination of factors that included need, readiness, community support and appropriateness of their district. With the addition of these four communities, the number of Designated Virginia Main Street Communities grows to 25. Each community brings a unique set of historic assets and strategic focus to its revitalization work. 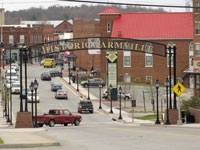 Bristol and St. Paul, in Southwest Virginia, are aligned with a 19-county strategy that promotes the region’s cultural heritage and natural assets. Downtown Hopewell’s placement on the James River is the centerpiece of a local quality of life strategy, and Farmville is strengthening ties with local universities and the emerging regional cultural heritage strategies in Southern Virginia. Virginia Main Street will provide technical assistance, training, and expert resources to assist the communities with aligning resources and achieving these goals. We are pleased to have these folks on board and ask that you help us welcome them.